DUE TO SUPPLY PROBLEMS, WE ARE NO LONGER CARRYING TEE-SHIRTS. SIZES: Adult sizes are Small 34-36, Medium 38-40, Large 42-44, XLarge 46-48, XXLarge 50-52, and XXXLarge 54-56. Children sizes are XSmall (This size is available in most designs) 2-4T, Small 6-8, Medium 10-12, Large 14-16. Birdstones, pendants, stone pipes, bannerstones, discoidals, and gorgets. 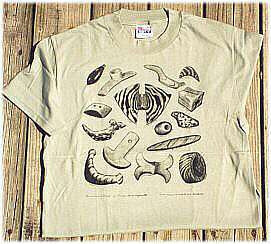 This design is printed on a stone washed green 100% preshrunk cotton shirt. IMPORTANT NOTE! It is available in this color and in adult sizes only. 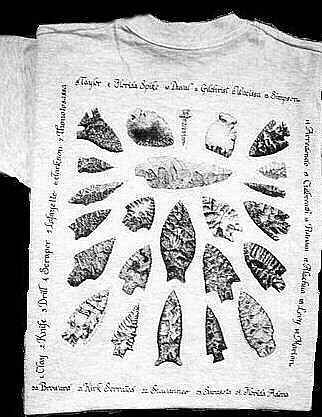 This two sided pattern features 49 points and tools all found in Florida and the extreme southeast. 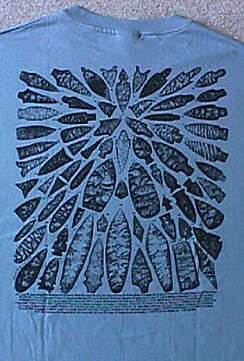 George has authentically replicated the chipping techniques used in this ultra detailed illustration, including several different flint types. The archaeological type names are listed around the calligraphic border. 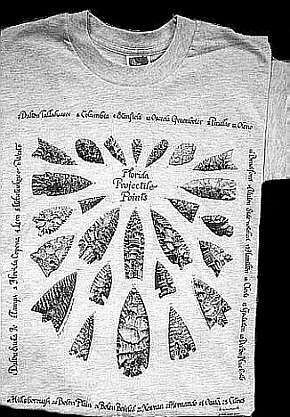 This two sided design illustrates 156 projectile points ranging from the tiny bird or dart point through the finely serrated Hardy Beveled and the newly classified Flint River point. 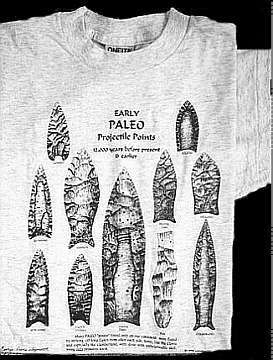 As in our other shirts, all points have been identified by an easy system of identification linking the points with their archaeological type name. 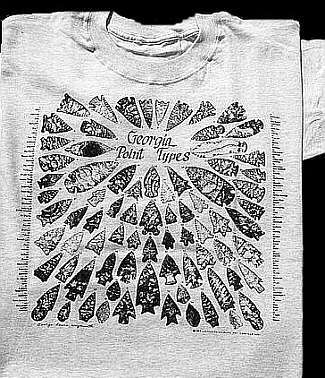 This is a two side design printed on an ash colored tee shirt. 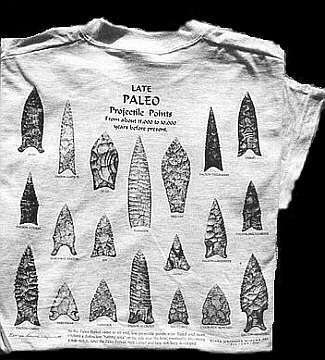 From as early as the Paleo era, through the Archaic, Woodland, and into the Mississippian period Native Americans left a diverse selection of magnificent artifacts behind. George Weymouth has captured in ultra detail, 148 "KEEPERS" found in Kentucky. Point types have been identified under the design. 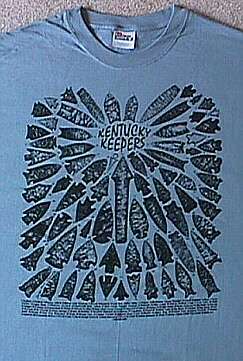 This is a two sided design is only printed on a Kentucky blue or steel (a dark gray) tee shirt. 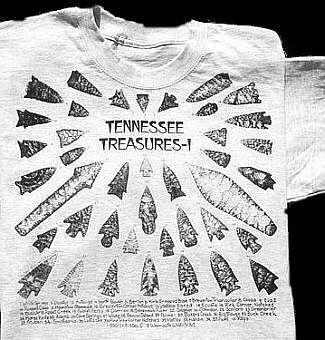 Master shell artisan Dan Townsend and Eloise Weymouth have teamed up to design this tee about ancient shell gorgets. 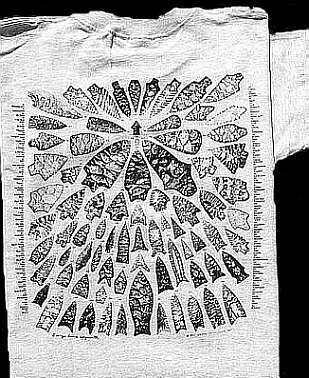 Although many of their meanings have been lost through the ages, these unique engravings from the Mississippian culture have been found in a number of archaeological sites. 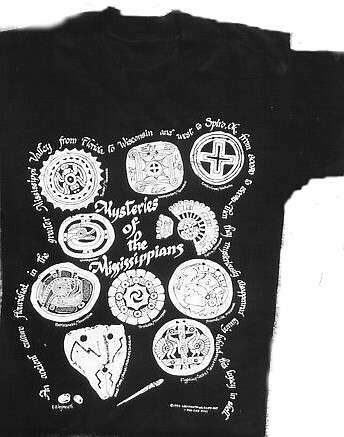 This is a one sided design printed on a black colored tee shirt. 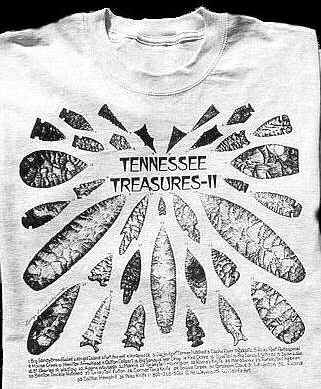 The magnificent projectile points found on these Tennessee shirts show the multiplicity of point type forms used by the ancients who inhabited this land of the Tennessee River Valley. 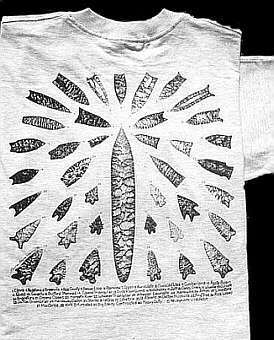 George Weymouth has captured, in ultra-detail, over 160 projectile points. Point types have been identified under the design. Both are two sided designs printed on ash colored tee shirts.